Plastic packaging production often has to deal with low part weights and high output rates. 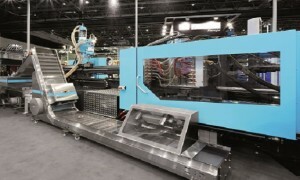 High-speed applications such as closures and thin-wall containers are a major challenge for any injection moulding machine . At Arabplast, which will take place from 10th until 13thJanuary, 2015, in Dubai, UAE, Sumitomo (SHI) Demag’s team of packaging experts will provide interested visitors with in-depth consultancy on their packaging-specific projects (Hall 5, Stand D 110). During the production of high-speed food packaging applications, the finely-tuned interaction between injection moulding machines, moulds and automation equipment is the key to high output rates. El-Exis SP machines from Sumitomo (SHI)Demag Plastics Machinery GmbH of Schwaig near Nuremberg/Germany provide the perfect platform for the cost-efficient production of complex packaging applications. In Halle 5, Stand D 110, a team of packaging experts from the German-Japanese machine manufacturer Sumitomo (SHI) Demagwill provide interested visitors with comprehensive information on injection moulding and plastics processing. With their combined technical knowledge and experience, the expert team is able to provide customers with in-depth technical and organizational consultancy for planning, designing, configuring and commissioning units for thin-wall packaging and closure production. Project support is provided for the entire set-up, including the injection moulding machine, mould technology as well as automation and other ancillary equipment. In Dubai, Arnaud Nomblot, Business Development Manager Packaging, will be happy to provide visitors with his in-depth market intelligence. With its extensive product knowledge in the packaging segment, Sumitomo (SHI) Demagis a reliable system provider with close contacts to other companies involved in the production chain. This way, Sumitomo (SHI) Demag can provide customers with turnkey production solutions for packaging applications from one source. Thanks to the company’s impressive international sales and service network, Sumitomo (SHI) Demag can provide its customers with one-to-one local support.